Amelia – Available for Adoption! My name is Amelia and these nice people at Pug Partners are trying to helping me find my perfect forever home. 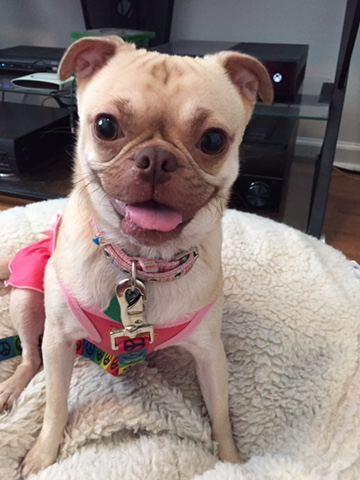 You see since I was rescued I have learned to embrace the Pug Life as a Chug and I am one happy little girl. I very much enjoy playing with my foster brother Pico and every day is like recess! I love playing fetch, wrestling and a good game of tug-o-war. I would love it very much if I had a Pug brother to grow up with and a nice fenced in yard to play ball and run. My Foster Mom says she is quite smitten with me, whatever that means…but she seems to very much enjoy when I curl up next to her at night and put my head on her neck to snuggle. She then tells me she loves me and that I am quite special and perfect in every way. Interested in adopting Amelia? 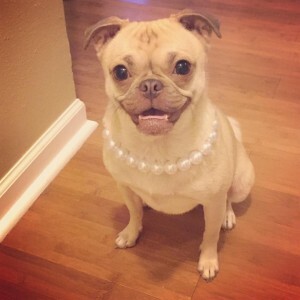 Please see our website and fill out an application at: www.pugpartners.com/adoption-application Amelia’s minimum adoption donation is $400.